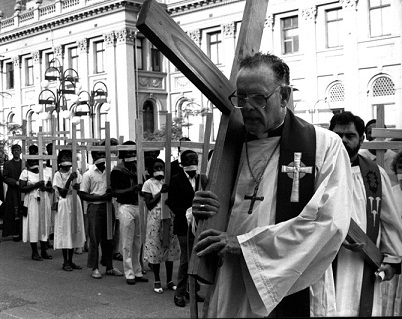 Denis Hurley was a courageous opponent of South Africa's aparthied regime for 50 years, dubbed "an ecclesiastical Che Guevara" by a South African politician and "guardian of the light" by Alan Paton. He was a champion of the reforms and spirit of Vatican 2 which he regarded as the highlight of his life. Born in Cape Town in 1915 of Irish parents, he became the youngest Catholic bishop in the world in 1947, at 31years of age, and archbishop of Durban in 1951. He retired as archbishop in 1992, becoming chancellor of the University of Natal from 1993 to 1998. He continued to work as parish priest of Emmanuel Cathedral well into his eighties.